I am in shock that the summer is over…although technically we’re still in that transition stage between school starting (and the end of summer vacation) and Labor Day (the closing of the pools – sad!). While we prepare for Labor Day coming up next week (picnic/pool/party time! 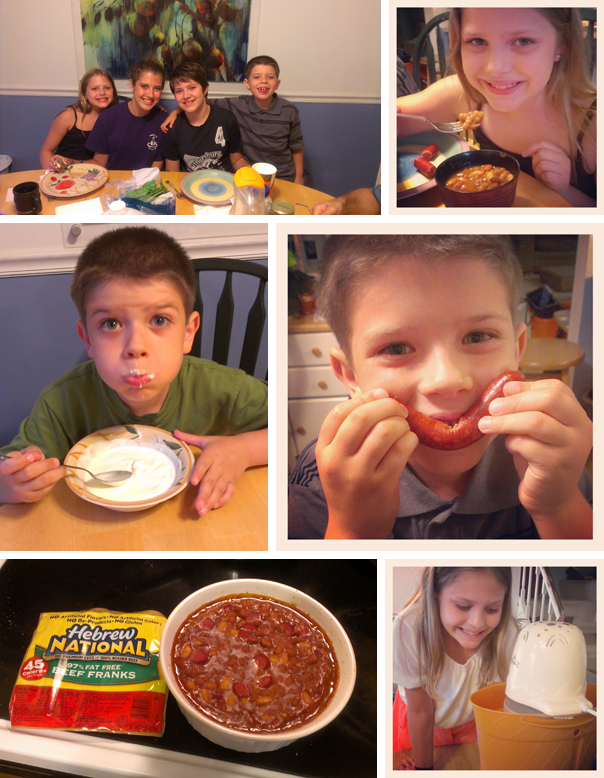 ), I’ve been testing out a few new recipes on my kids – and what better time for a mock celebration than the night after the first day of school? 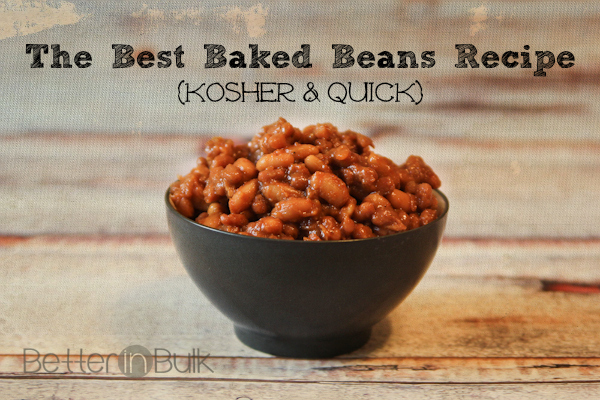 I’ve been eager to find a baked beans recipe that I could cook along side our typical BBQ/party fare (freshly made, hot off the grill hamburgers and Hebrew National hot dogs, of course!) and this week I came up with a total winner! Several family members went back for seconds and a few of the kids commented that they’d never liked baked beans before I made them. Score! 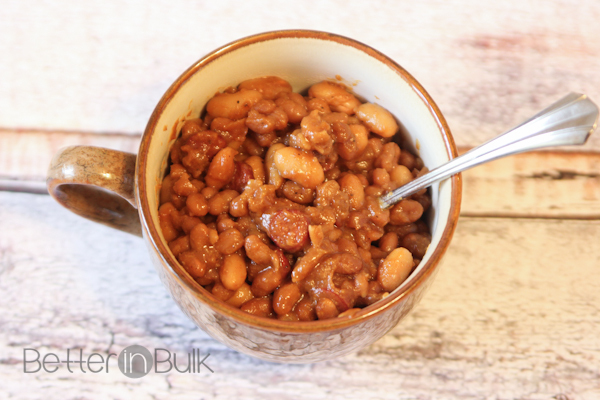 Pour bean mixture into a small casserole dish and heat in a 375 degree oven for 30-40 minutes, or until liquid has thickened. In addition to these crowd-pleasing Kosher baked beans, one of the BIG things we got in preparation for our Labor Day celebrations was a new ice cream maker. Our old one broke several years ago and we never got around to buying a new one…until this weekend. There’s nothing like homemade ice cream! Just like the baked beans recipe, I HAD to test out a basic vanilla ice cream recipe (which is kosher, as well!) and will be sharing that soon, too. Nothing sets apart a get together with family and friends like homemade ice cream. Can you tell we had a great time celebrating back to school? We’re all set to have an incredible Labor Day! Win franks with the #99SummerDays program! I know that a few of my kids would be in heaven if I won I won a supply of Hebrew National hot dogs. Wouldn’t yours? Entering the contest is easy. First, become a fan of Hebrew National on Facebook and then tell everyone why YOU love Hebrew National…and you could win free franks! This sounds soo good! I love baked beans, especially with hot dogs, and they are good ones. The best baked beans I ever had was when I made them on the woodstove. You can let them back on a back burner for a couple of days, all that molasses goodness and hearty and good comfort food, especially if you have just come in from the cold. Hang your wet mittens on the upper shelf of the stove and then cozy up and have some beans with freshly baked bread. sounds delicious, I love this brand hot dogs too! My husband loves Gulden’s mustard. I’ll have to try this recipe soon! I have never made home made baked beans. We do not eat them often. BUt we like to have them for picnics so maybe I will make them for that.